Sold Secure is an independent, non-profit organisation based in the UK. They test and certify locks to make it easier to compare the security levels between different types and brands. No lock gets out of here alive: the Sold Secure workshop! Manufacturers can submit their locks to Sold Secure who will try to defeat them using a wide range of different tools and techniques. They then classify each lock according to the amount of time it took to defeat it, with three available classifications: Bronze, Silver and Gold. In the past, Sold Secure stated that a Bronze rating was for locks that could withstand “a minute with basic tools”, a Silver rating was for locks that could resist for “three minutes with a wider selection of tools” and Gold was for locks that lasted “five minutes with a sophisticated array of tools”. The purpose of the organisation is to test locks. They know what they’re doing. All this means that the Sold Secure rating system is the easiest and most accurate way to judge the security of a bike lock. Sold Secure Gold or Silver: which do you need? If two or more of your answers put you in the “High Risk” column, you should seriously consider a Sold Secure Gold rated lock. Whereas if two or more of your answers put you in “Lower Risk” column you could possibly get away with a Sold Secure Silver lock. I don’t recommend Sold Secure Bronze locks at all because I don’t feel they give enough protection. So how can you find locks with a Sold Secure Gold rating? Well, you can find a complete list of Sold Secure locks (and other security items) on their website. But it’s not very user friendly. 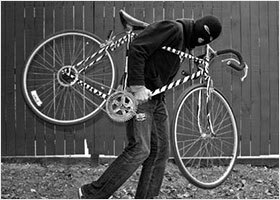 So I provide a list of the best Sold Secure Gold bike locks here. If you click on the names of the locks in the table, you’ll be taken to Amazon where you can further compare prices and reviews. These are affiliate links. 1. Are all Sold Secure Gold locks as secure as each other? No, not at all. The easiest way to tell the difference is to look at the “Thickness” column in the table above. Generally, the thicker the lock, the more secure it will be. 2. This list is missing some very secure locks. Why? For a lock to be rated by Sold Secure, it must be submitted by the manufacturer. And there’s plenty of really good locks that are either never submitted or have not been submitted yet. But that doesn’t mean they’re not Sold Secure “standard”. These are all Sold Secure Gold “standard” bike locks that don’t have a Sold Secure Gold rating. If a lock without Sold Secure certification has the same manufacturer rating as a lock with certification, it’s most likely Sold Secure “standard”. If you need more help choosing the best bike lock, follow my simple 3 step guide that guarantees you’ll pick the right lock for both you and your bicycle. Can you tell me which of the Sold Secure Gold u-locks comes with a bike mount or has one available? I think all the u-locks come with a mounting bracket except the Kryptonite Fahgettaboudit, Kryptonite New York M18-WL, the Abus Yellow mini and the OnGuard Brute LS. Great! Thanks for answering my question. Btw, I found your articles on bike locks very informative and it has helped me decide on what lock to purchase. This is very helpful. Are any “gold” level locks made with combinations? If not, do you know why? Not that I know of Amy. And that’s because combination locks tend to be less secure. Hi. My bike shop sells the Oxford alarmed u-lock. It only has a silver sold secure rating. 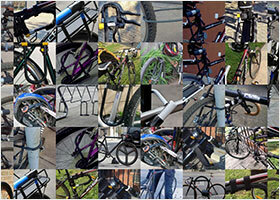 I would welcome your views on it please – I’m trying to decide between it and the abus 540. I don’t think you should be trying to decide between a specific silver lock and a specific gold lock. What do you think your risk level is? If it’s high you need a gold lock. If it’s lower you will probably be OK with a silver lock. Once you’ve determined what security level you need, then start thinking about specific locks. As an aside, I haven’t been too impressed with most of the Oxford locks I’ve used. That’s really helpful Carl, thank you. I think the gold ABUS wins. I’m also looking at the Shed Shackle for storage purposes. Your site has been really helpful. What about the Lifelok? It’s a Sold Secure Gold rated zip lock. Seems to be the best lock in existence, as an all rounder. Please reply, I’m terribly interested in your opinion. re last message, ‘LifeLock’ is an ID theft solution. 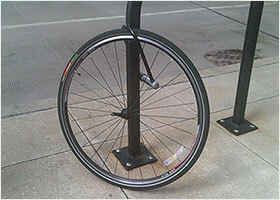 ‘Litelok’ is a gold standard bike lock. Yeah, I think he means litelok. This article is really helpful! thanks. Only thing is that my insurer asks for a security level 8 lock and I can’t find how that translates into bronze silver or gold. Your expertise would be really welcome! Hi Lizzy … Who is your insurer? Yes the security looks good and it’s a great price! Sometimes these cheaper locks tend to get stuck, either in the mechanism or where the bars meet the body. But if you keep both well lubricated you should be OK.
Hi, I believe the Hiplok DX(C) is missing from this list. According to your review (http://thebestbikelock.com/best-u-lock/hiplok-dxc-review/), it is gold rated. I have bought the ABUS U-Mini 40 on your recommendation as Gold Secure and the packaging says it’s Sold Secure Silver not Sold Secure Gold. My insurance only covers Gold and now I’ll have to return it. Can you help clarify or perhaps an update to the page would be useful? Yes, the Mini 40 is Sold Secure Silver. It’s the Mini-401 Yellow that’s Sold Secure Gold. On this page you’ll find the 401 Yellow. And on the Sold Secure Silver page you’ll find the 40. I know it’s extremely confusing. The names are almost identical. And the locks also look identical. The listings on the website are correct though. Did you buy it from Amazon? Maybe the link takes you through to the wrong Amazon page. What country are you in? The litelock was shown to be breakable in less than a minute last year through simple levering with a twist. In light of this, should this lock still be in the Gold classification? I tackle this issue in my review of the Litelok. not sure if you are still updating the site content, but you’re missing some locks on this list with updates to manufacturers product lines. Yes I’m always trying to keep it up to date. I added a couple last month. Which ones are you thinking of specifically? Are the height and width of U-locks always inner dimensions? In the article on the fahgettaboudit mini, it seems so. That would be great but I’m not sure. thanks! I have just ordered a Kriptonite mini 7 with 4 foot cable. The description on the sellers website said it was Sold Gold but in their specification it was Sold Silver ! Would you be able to clarify things please ? Yes this is a ridiculous situation, to great degree caused by Kryptonite themselves. 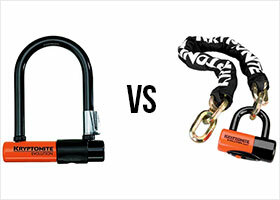 Both locks have a 13 mm shackle in the same “hardened max-performance steel”. And they’re both exactly the same size. The difference is that the Silver version has the bent foot shackle that only locks on one side. While the Gold version has a shackle that locks on both sides. Bizarrely Kryptonite themselves rate both locks with the same 7/10 security rating! So yes if the sellers website described the lock as Gold but the lock you’ve received is Silver then they’ve sent you the wrong lock. But Kryptonite themselves have made the situation very confusing! Kryptonite’s whole line of locks now locks on both sides which is why their locks retain the same ratings. The majority of consumers have no idea what sold secure is and at the end of the day they are getting a better lock. You won’t find another sold secure gold lock that’s this affordable. The new updated version is very obvious because the shackle tips are visible on the bottom on the crossbar and they use a new sliding dust cover. Yeah but the problem is that they’re still selling both versions. Two locks that look more or less the same, with the same name and the same in house security ratings. But in reality they offer different levels of protection. I’d say that was pretty confusing for the consumer and often it seems the sellers. And I’m a huge Kryptonite fan and they are great value for money. But there are cheaper Sold Secure Gold locks available. I agree with you on the confusion but it’s hard to make a running product change without old and new both being available at some point. Not without re-branding their product but creating families or product seems to be easier on a consumer. Generally I think the OnGuard are the most affordable of the well known lock brands that are Sold Secure rated. You can get a Pitbull for around $30 and a Brute for around $40. For sure: they are neither as well made (or in some respects secure) as the Kryptonite equivalents. You’ll need to look after the mechanism and the joints with cleaners and lubricants for example. But in terms of affordable Sold Secure locks, they’re hard to beat. I almost purchased the Kryptonite one, but checking the weight and specially that you can order the Abus with a mount (Granit X-Plus 540 230mm With EaZyKF Bracket) I’m in doubt how much more secure Kryptonite is to justify the burden of carrying it around. Thanks a lot for the content! It really depends on your personal circumstances (bike value, how/where you use it etc). But while the Kryptonite M18-WL is likely to be slightly more secure than the Abus 540, it’s also much heavier. And the Abus 540 is still a very secure lock. So unless your circumstances are exceptional (super expensive back that you leave for a considerable length of time in the open) I’d generally recommend the Abus. Just because it’s more practical. Mini-7 with Flex of 1.61kg include the weight of the cable? If so what is the weight of the lock without the cable? Is this lock secure from bottle jack attack? So sorry for the delay getting back to you! Yes I think it does include the cable, so without the cable it should be around 1.3 kg. Bottle jack attacks can defeat the strongest of locks. But they have to get inside the lock to work. Since the Mini 7 is a smaller lock this is less easy so as long as you keep the lock full of your bike and whatever it’s locked to you should be OK. I have recently bought an OnGuard Pit Bull Sold Secure Gold D lock with steel cable. The lock is heavy (as with all Gold locks) and it’s a solid piece of kit, which I need in London! The D lock is not a mini one (mini locks can only secure the frame and not wheel & frame) and is quite large, so I cannot find a place to fit the bracket on my bike where the lock itself will not get in the way of my legs. I can’t fit it to the seat post, because there is no extra height in the post to locate it and the triangle frame of the bike isn’t large enough for the lock, due to the thick aluminium down tube. I will always need to carry a rucksack wherever I go which is annoying. I have also noticed that the council in central London (zone 1) have installed bike racks with thicker tubes, so it’s a squeeze to use a standard D lock on these. I’m wondering if they’re doing this to force cyclists to get Sold Secure Gold locks of a good enough size to lock both the frame and back wheel? No I don’t think the council are doing that Dave! It’s probably just that thicker tubes are more secure in general. There’s been a spate of thefts where the racks have been sawn through and then the cut has been hidden by a thief, so that when bikes are secured to the rack the thief only has to slide the bike through the cut! Maybe the thicker tubes are an attempt by the council to counter this? Hi Carl, as mentioned, I recently bought an OnGuard Pit Bull Sold Secure Gold D lock with steel cable. I went onto their website to register the keys (don’t know why I need to, because I have 5 keys), but I thought it would be a good idea. Do you think it’s worth registering the keys, as long as I keep them safe and two with a friend? Unfortunately, the key registration page is only for people living in the US and when I went onto their International site, there was no link to register the keys! Can anyone help with registering OnGuard keys in the UK? I also read their anti-theft terms and conditions, which makes is almost impossible to make a claim. This is also the same with many other lock manufacturers, so they are really no better than the other when paying out. After some research, I found that the company: MAGNUM is the same company as OnGuard and Magnum’s website can be used to register OnGuard keys. I only found the UK registration page, so I apologise to those who are not in the UK. Personally, I don’t know why the keys needs to be registered, because 5 comes in the pack! All Sold Secure Gold D locks will need an angle grinder to break through them and all the manufacturers (Abus, Kryptonite, OnGuard, Magnum) will not compensate the owner for the cost of the bike or the lock if the lock was broken using an angle grinder. This makes the use of the anti-theft registration pointless! I hope the information I have provided helps those who has been looking! Keep you bikes safe and enjoy riding! Unfortunately even Sold Secure Gold locks can be beaten with methods other than angle grinders (leverage, car jacks). And as far as I remember, it’s oly OnGuard / Magnum that specifically say that they won’t compensate if the lock was defeated with an angle grinder.